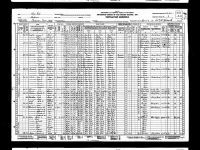 [S00013] 1920 United States Federal Census, Images reproduced by FamilySearch, (Ancestry.com Operations Inc, 2010. ), [database online]., Herkimer, Herkimer, New York, ED , roll , page , image 756. [S00014] 1930 United States Federal Census, Ancestry.com, (Ancestry.com Operations Inc, 2002. ), [database online]., Herkimer, Herkimer, New York, ED 27, roll 1441, page 2A, image 1103.0. Ancestry.com. Massachusetts Death Index, 1970-2003 [database online]. Provo, Utah: MyFamily.com, Inc., 2005. Original data: State of Massachusetts. Massachusetts Death Index, 1970-2003. Boston: Commonwealth of Massachusetts Department of Health Services, 2005.